Posted on 11/28/2017, 3:24 pm, by kittykill, under Handmade Gift Ideas, Holidays. Do you have a friend who is addicted to home decorating shows? Not sure what to make them this gift giving season? Brighten up someone’s life with Gemstone Candles. Craftster member DaBunny shares her tutorial for this illuminating decor that will look beautiful as a centerpiece for a holiday table. 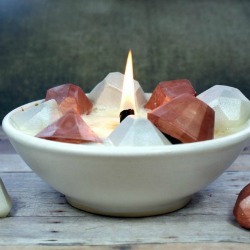 You can make Gemstone Candles in a variety of sizes and colors. Gemstone Candles are perfect for any time of year, not just the holidays. They make great outdoor accents.Customize the candles even more by adding a favorite scent. Get inspired with ideas from our Handmade Holiday Gift Guide. Make a gift for someone special and see their face light up! Thank you for featuring this tutorial! They are GORGEOUS!